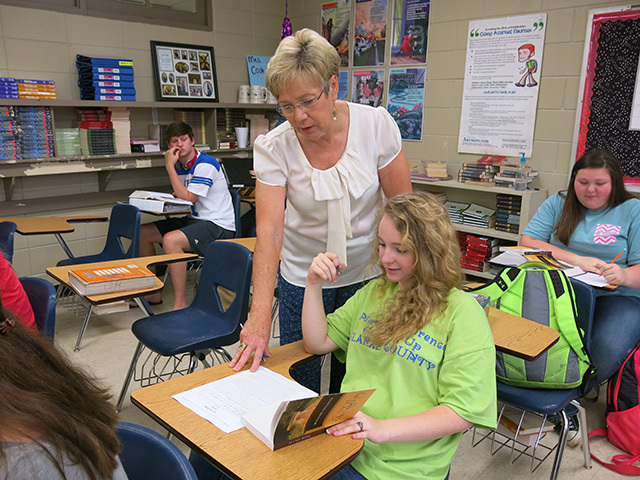 ETERPRISE - Linda Cook enjoys teaching so much that she came out of retirement to teach both English and Spanish this spring at Enterprise High School. 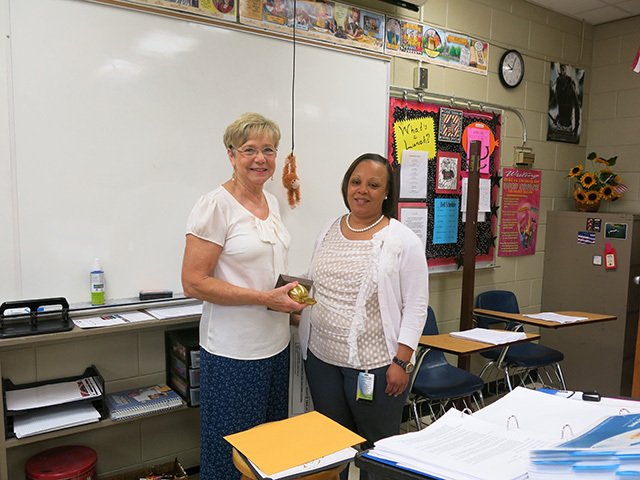 Cook is the May Golden Apple Teacher of the Month and she is the last award winner for the 2014-15 scholastic year. 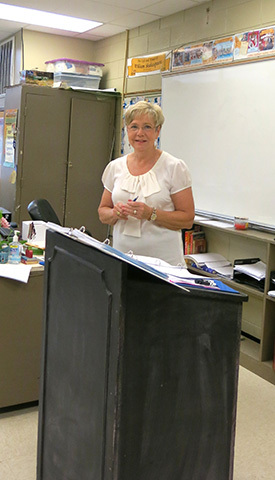 She said after 37 years as an educator, it was a surprise to get honored by her peers and students. 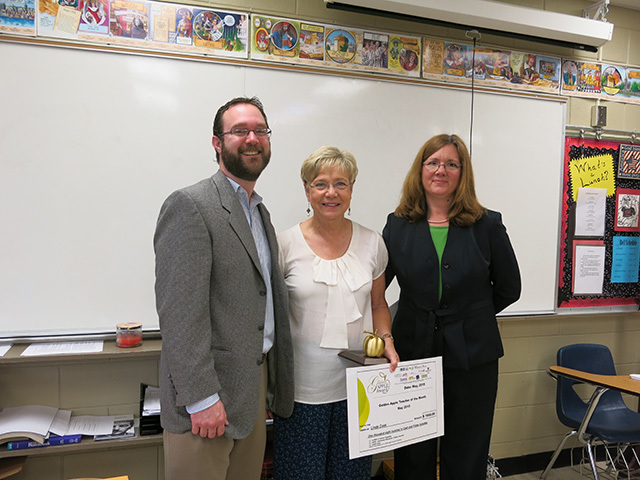 Cook was informed of her selection during a surprise announcement when sponsors of the Golden Apple Award program entered her classroom. "I am shocked and especially so because no one comes into my classroom," Cook said. "That's why I was surprised when all these people starting coming into my class. I was not expecting this, that's for sure." 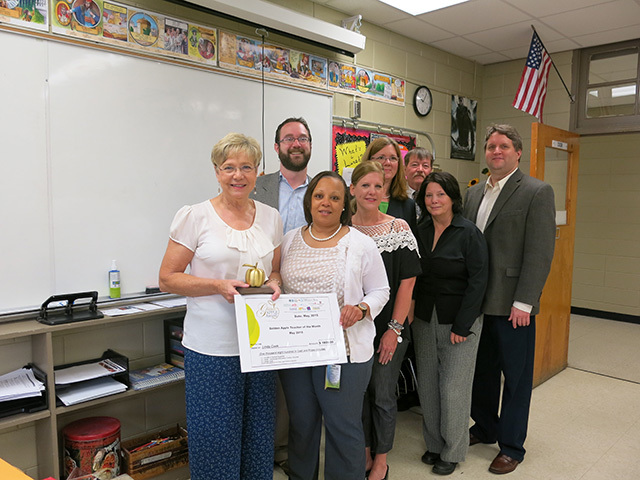 As the May Teacher of the Month, Cook was awarded $1,000 in school supplies by the Golden Apple Partners in Education, a $500 tuition voucher, and $300 in cash. Martin will also be in the running for the Teacher of the Year award, which will be announced later this month. The winner will receive a $2,500 prize and a $2,500 scholarship for a graduating senior of the winning teacher's choice. On May 28, all nine of this scholastic year's Golden Apple winners will gather for an honorary banquet in their honor and there the 2014-15 Golden Apple Teacher of the Year will be named. Cook said she has enjoyed her teaching career. "I've had 37 wonderful years and here I've enjoyed the greatest amount of support," Cook said. "This kind of validates what my life has been about. Everything has been worth it." After 36 years, Cook retired, but then came back this spring for a fairly simple reason.